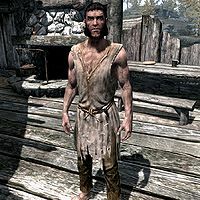 Narfi is a Nord beggar living in Ivarstead. Up until a year ago, he lived together with his sister, Reyda, in the broken down home of his parents. However, his sister disappeared and the now insane Narfi will ask you to investigate her whereabouts so he can say goodbye. 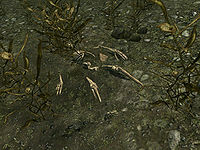 One of the first contracts from the Dark Brotherhood is to kill him. He spends his entire life in the ruined home across the river from Ivarstead. He sleeps on his bed roll every night between 4am and 9am and then just wanders around all day long, interrupted only by one-hour meals at 10am and 8pm. If Hearthfire is installed, he can sometimes be found mining the newly added stone quarry close to his house. He wears nothing but a set of ragged robes. He carries a spare set of robes, an iron dagger, and a handful of lower-class items and gold. It is advised to help him find his sister before initiating the related Dark Brotherhood quest, for obvious reasons. If done correctly, the first thing he will say to you is: "Oh Reyda! Redya [sic]! You live among the clouds now, dear Reyda! ", "I miss Reyda. She was so nice to Narfi. ", and "Narfi's sad he can't be with Reyda." When you talk to him, he may say: "I can't see you, Reyda! I can't find you! Why are you hiding? Hiding, hide, hide, hide! Don't make me sad!" While it is clear that he is mentally ill, you can ask him if he is okay: "Reyda was here, then gone. Went to gather plants and never came home... nope, nope. Everyone looked and no one could find her. Wilhelm said she'll be back... told Narfi not to worry... Reyda will come back." When you ask directly what is wrong with him, he will respond: "With father I said goodbye... with mother I said goodbye. Reyda leaves and Narfi can't say goodbye. Makes Narfi very, very sad. Narfi needs Reyda to say goodbye." When you exit conversation, he will say one of three things: "The mountain will eat you! Watch the mountain! ", "Reyda! Reyyyyda!" or "If you see Reyda, tell her that Narfi misses her and to come home soon... very soon. Soon... soon, like the moon!" Inside Vilemyr Inn, proprietor Wilhelm will elaborate on the sad situation with Narfi: "He's harmless. He's been in a state ever since his sister Reyda disappeared over a year ago. He just keeps to himself in what's left of his folk's farmhouse across the river." He also reckons he told Narfi his sister might be coming back some day: "I just said that to make the poor guy feel better. I'm pretty sure she's dead. Reyda would gather ingredients from the small island in the river east of here. Then one day, she just vanished. I tried to look for her, but she never turned up." When you have discovered Reyda's remains at the bottom of the river and claimed her necklace, a return to Narfi will be either sad or encouraging as you can choose to let Narfi in on her death or continue Wilhelm's lie to cheer him up. Three options are available. If you choose to give him Reyda's necklace, he will be quite happy: "Reyda! You saw Reyda? Did you tell her Narfi cries? Did you tell her Narfi never said goodbye like mother and father?" This leaves two options. If you tell him she is dead he will break down: "Oh no! No, no, no. Narfi never got to say goodbye! Now Narfi's all alone." If you tell him she will be home soon, he will be overwhelmed with joy: "You've made Narfi so happy! Narfi now waits for his sister until she comes home." Both options will end with him thanking you for the effort and rewarding you: "At least Narfi has Reyda's Necklace... reminds Narfi of his sister. Thank you for giving this to Narfi." If you chose to tell him the truth he will now greet you with: "Narfi's sad now. Still wait for Reyda. No more sleep. No, no... no." If you chose to lie to him, he will greet you with: "Narfi's happy now. Maybe Narfi can sleep. Sleep all night. Sleep, sleep, sleep." When the deed is done, Nazir will congratulate you: "Congratulations. You slaughtered an emaciated beggar in cold blood. You are truly an opponent to be feared." This page was last modified on 3 April 2018, at 08:27.